The Intel® Xeon® E based TS-883XU enterprise NAS with up to 64 GB DDR4 ECC (Error Correcting Code) memory delivers server-grade performance with dependable reliability. It features Mellanox® ConnectX®-4 Lx 10GbE controllers that not only fulfill bandwidth-demanding applications but also support iSER to offload CPU workloads with boosted virtualization performance, while PCIe expansion allows for installing graphics cards to empower video surveillance, virtualization and AI applications. The performance-driven TS-883XU provides you with advanced business-ready features, including software-defined SSD extra over-provisioning, software-defined networking & virtual switch, and much more. The TS-883XU features an Intel® Xeon® E-2124 quad-core 3.3 GHz processor (burst up to 4.3 GHz) and 8 GB DDR4 ECC memory (upgradable to 64 GB), delivering server-grade performance and dependable reliability for rugged enterprise IT environments as a cost-efficient NAS solution. Besides 4 Gigabit RJ45 LAN ports, the TS-883XU comes with two 10GbE SFP+ SmartNIC LAN ports to provide a significant performance boost. Client PC: Intel® Core™ i7-6700 3.40GHz CPU; 64GB RAM; MLX CX3 10GbE NIC; Windows® 10 64-bit; IOmeter 1.1.0 20 workers 1 outstanding, SMB throughput, 64KB, 30S ramp up time, 3M run time. The Intel® Xeon® E based TS-883XU uses ECC memory that can detect and correct single-bit memory errors as they occur to prevent downtime and data loss, which is essential for always-on, mission-critical, server-grade applications. The TS-883XU supports dual-channel DDR4 memory in four Long-DIMM slots. When using paired memory modules, the TS-883XU can leverage the power of dual-channel architecture to boost performance. You also customize the memory configuration (supports up to 64 GB RAM) of the TS-883XU for greater performance to tackle dynamically-changing workloads such as virtualization. The TS-883XU features outstanding hardware and expandable architecture, enabling optimum performance and flexibility to fulfill business needs in performance and application diversification. The TS-883XU provides two 10GbE SFP+ ports that use the Mellanox® ConnectX®-4 Lx SmartNIC controller. They support the iSCSI Extensions for RDMA (iSER) protocol, allowing data to bypass general network drivers, the socket layer, and to directly enter memory buffers of the ESXi server and storage to offload CPU workloads. When both the VMware® server and the TS-883XU support iSER, it can provide up to 60% increased random read/write performance and 50% decreased latency, providing an essential tool to optimize demanding virtualization applications. The TS-883XU provides multiple PCIe slots. To ensure that the SATA drives have sufficient bandwidth, it is recommended to only use low-end expansion cards, (such as a 1GbE NIC, USB 3.0 card, or Wi-Fi adapter) with the PCIe Gen2 slot (Slot 1) as this slot is connected to the PCH. For high-end expansion cards (including 10GbE/40GbE NICs, SAS cards, Mustang-200 acceleration card, and graphics cards), it is recommended to use PCIe Gen3 slots (Slot 2, 3, 4) as these slots are connected to the CPU. The TS-883XU features 4 PCIe slots that allow for the usage of various expansion cards to expand application potential. Graphics cards are optimized for graphical calculations and transformations. The TS-883XU provides PCIe slots for installing an AMD Radeon™ or NVIDIA® graphics card to boost data-intensive AI machine learning, while also providing benefits for imaging processing and virtual machine performance (via GPU passthrough). By enabling Qtier™ auto-tiering on the TS-883XU, organizations can just buy the amount of SSDs needed, and attain the highest value/performance and optimal storage efficiency for data storage and sharing. SSD caches accelerate IOPS performance and reduce latency for storage volumes. They are perfect for IOPS-demanding applications (including databases and virtualization) and can significantly improve overall workflows. The TS-883XU also supports write-only SSD caches to greatly boost write-intensive applications and also RAID 5/6 SSD caches for higher performance and caching space. Qtier™ Technology empowers the TS-883XU with auto tiering that helps continuously optimize storage efficiency by automatically moving data between 2.5-inch SSDs and high-capacity HDDs based on the data's access frequency. Qtier™ 2.0 features IO-awareness that empowers SSD-tiered storage with a cache-like reserved space to handle burst I/O in real time, greatly maximizing the advantages of SSDs. The TS-883XU supports software-defined SSD extra over-provisioning (OP) that allows you to allocate additional OP space (from 1% to 60%) to optimize random write speeds and to extend SSD lifespan. Now you can use affordable consumer SSDs for the TS-883XU, adjust the SSD OP, and potentially attain performance and endurance levels similar to enterprise-grade SSDs to enjoy faster file backups, smoother multimedia experiences, and optimized virtualization applications. The TS-883XU supports QVR Pro surveillance solution with 8 license-free channels for surveillance monitoring, which can be expanded up to 128 channels* with additional channel license purchase for a more extensive security deployment. QVR Pro supports over 5,000 IP cameras, including all of the standard fisheye cameras available on the market. There are more advanced features for fully unleashing the potential of fisheye cameras: allowing a single fisheye camera’s image to be simultaneously viewed in nine channels from different angles, and cross-platform hardware-accelerated decoding for fisheye camera images. QVR Pro ensures higher surveillance performance for greater security while providing deployment flexibility and budget-savings. The Network & Virtual Switch application allows you to leverage limited physical network resources for unlimited virtual applications and centrally manage the entire network structure with a brilliantly-visualized network topology map. Flexible manageability enables you to reorganize physical and virtual network connections with greater ease, so you can allocate adequate network resources to the TS-883XU, virtual machines and containers whenever needed. The network deployment is greatly simplified while your network management efficiency is greatly improved. The TS-883XU provides a reliable, flexible backup & disaster recovery solution to assist organizations in routine backup jobs with cost-efficiency and high productivity. Snapshots are essential for NAS data protection, and their block-level feature makes them a dependable method for protecting data in the face of the growing threat of ransomware. 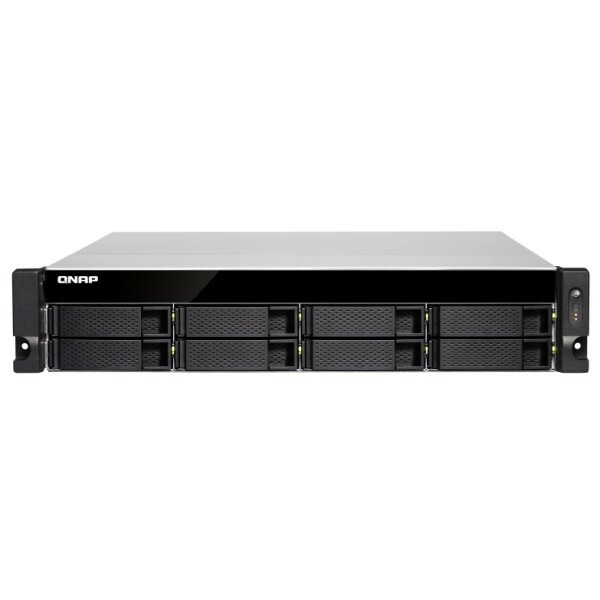 The TS-883XU supports up to 256 snapshots per volume/LUN, and up to 1,024 snapshots per NAS. With high performance, potentially huge storage capacities, integrated virtualization solutions, and support for snapshots that record the state of the system at any time, the TS-883XU is perfect for backing up virtual machines. The TS-883XU supports block-based iSCSI LUN that provides a more reliable and isolated environment than file-based LUN. Supporting VMware®, Citrix®, Microsoft® Hyper-V® and Windows Server® 2016, the TS-883XU provides a high-performance, reliable and affordable storage solution for virtualization environments, while also supporting VMware VAAI and Microsoft ODX to increase performance by offloading server loading for ESXi server and Hyper-V respectively, and supporting QNAP vSphere Client plug-in and QNAP SMI-S provider with enhanced operational efficiency and management in virtualization applications. In open network environments, data on connected devices may be exposed in a potential hack. The TS-883XU provides numerous security options, such as encrypted access, IP blocking, 2-step verification, and more. Administrators can also control the access rights of each user to different folders, and use the following tools to enhance security management. Use VJBOD (Virtual JBOD) to expand your storage capacity by using the unused storage of other QNAP NAS. Up to 8 QNAP NAS can be mounted as local disks on the TS-883XU.